Perennials; usually glabrous, rarely minutely pubescent. Rhizomes (tuberiform, fragile), globose to ovoid or suboblong, (3-)4-10 mm diam., (fleshy, deeply underground). Stems erect, unbranched, (2-)2.7-6(-7) dm, usually glabrous, rarely pubescent. Rhizomal leaves 3 (or 5-7)-foliolate, sometimes simple, 8-25(-38) cm, leaflets petiolulate or subsessile; petiole (5-)8-25 (-32) cm; lateral leaflets (when present) petiolulate to subsessile, blade similar to terminal, sometimes smaller; terminal leaflet (petiolule (0.7-)2-5(-11) cm), blade (of simple leaf) ovate to orbicular to broadly cordate or reniform, (1.5-)2.5-7.5(-10) cm × (12-)20-90(-130) mm, base obtuse to cordate, margins entire or dentate to shallowly sinuate, (often with apiculae at veins ending at margin, sometimes minutely pubescent on veins). Cauline leaves 2-5, usually 3 (or 5)-foliolate, rarely simple, petiolate, leaflets petiolulate or sessile; petiole 1-5(-9) cm, base not auriculate; lateral leaflets sessile, blade similar to terminal, smaller, margins usually dentate, rarely entire; terminal leaflet sessile or petiolulate, blade usually broadly ovate to suborbicular or lanceolate, rarely narrowly oblong, 1-7 cm × (5-)10-47 (-65) mm. Racemes ebracteate. Fruiting pedicels ascending to divaricate, 10-33(-41) mm. 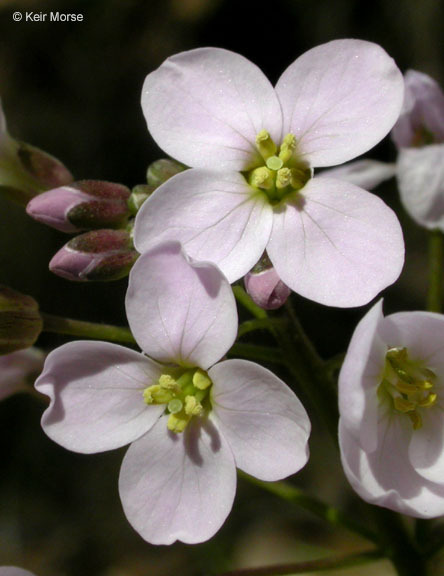 Flowers: sepals (erect to ascending), oblong, 3.5-4.5(-5.5) × 1.5-2 (-2.5) mm, lateral pair saccate basally; petals white to pale rose, often broadly obovate, 8-13(-15) × 4-8 mm (clawed, apex rounded); filaments: median pairs 4-6.5 mm, lateral pair 3-4 mm; anthers oblong, 1.2-1.7 mm. Fruits linear, 2.2-5.4(-6) cm × 2-3 mm; ovules 12-22 per ovary; style 2-5(-6) mm. Seeds dark brown, oblong to broadly ovoid, 1.7-2.8 × 1.2-1.8 mm. 2n = 32. Flowering Jan-May. Wooded ravines, forest floors, shady slopes, open woods, shady rock crevices, stream banks and bottoms, canyons, moist hillsides, cliffs; 0-1400 m; Calif.; Mexico (Baja California). The synonymy above suggests that Schulz, Detling, and Rollins did not agree on the characters used or the number and rank of taxa recognized. 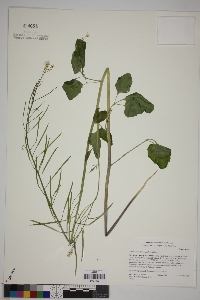 The taxonomy of this complex is based solely on differences in the number of leaflets, their division, size, and shape, all other aspects of these plants (e.g., rhizomes, flowers, fruits, and seeds) being fairly uniform. Indeed, the infraspecific taxa recognized represent only part of the overall variation in the species, and one is faced with either recognizing poorly defined infraspecific taxa or treating the entire complex as a single polymorphic species. In the absence of thorough biosystematic and molecular studies on this group, we prefer not to recognize any infraspecific taxa.